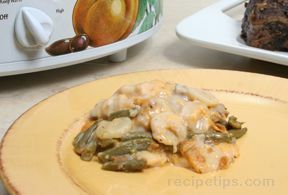 This dish will be a great complement to any meal, with the great flavor of the cheddar green beans and the interesting texture of the water chestnuts. Drain the beans and water chestnuts. First place the beans in the bottom of the crock of a 6 quart slow cooker and then the French fried onion rings on top of the beans. Then add the water chestnuts on top of the French fried onion rings. Combine the remaining ingredients in a bowl and stir until well mixed. Spread the mixture over the water chestnuts in the crock but do not stir into the beans. Place the cover on the slow cooker and cook for 5 to 6 hours. Or, cook on high for 3 hours. When the beans are done, serve them from the crock or remove and place in a serving bowl.